Home » Resources » How Often Does an Air Conditioner Need Service in Las Vegas? Nationwide, air conditioners are supposed to be serviced once a year. But in Las Vegas, many experts recommend two annual tune-ups—one before the hot season and one after. The reason for this is pretty straightforward: Las Vegas experiences extremely hot summer temperatures—much hotter than most of the rest of the country. That means that air conditioning units often have to run at very high levels every single day for months. This puts a lot of wear and tear on the unit, and results in a need for more frequent maintenance. In addition to the twice-a-year servicing, you need to change your AC air filter on a regular basis. This may be once a month or once every 3-6 months depending on the type of filter you use. What kind of servicing does my AC unit need? Changing the air filter or cleaning the filter if it’s a washable one. Cleaning all key components, especially the air compressor, which becomes less efficient if it gets covered in dust—and can even overheat. Checking for signs of overheating or any wear and tear on individual components—and replacing any components that might give out soon. If needed, adjusting AC settings to make sure it is running at the most energy-efficient level. Changing the filter is an easy task that anyone can do in just a few minutes. New filters often cost just $1-5 at a hardware store, or about $10 for longer lasting ones. Cleaning the air conditioner is more time consuming, but doable. You will need to open the housing and very carefully clean the compressor and the evaporator coils. Normally this means making a solution of water and a specific cleaning chemical—always follow the recommendations in your air conditioner’s manual. You may need to very gently use a brush to dislodge dirt, or if you have a source of compressed air this can also work. 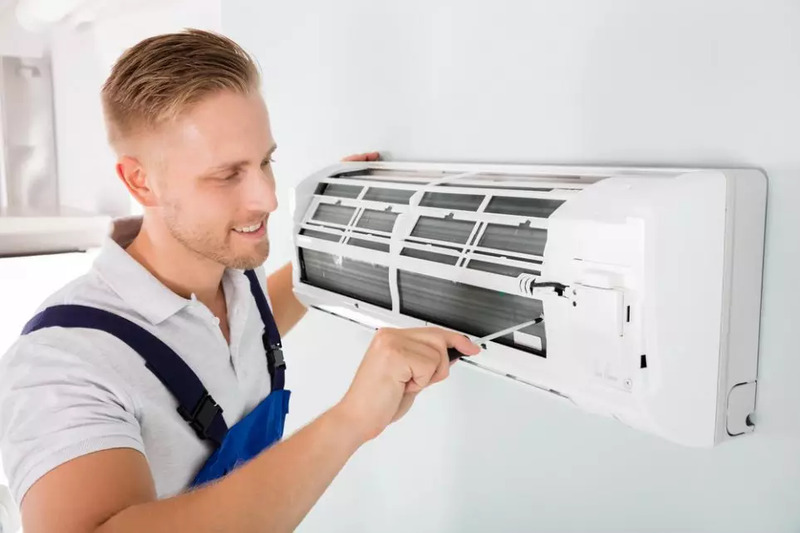 Inspecting and adjusting the air conditioner, or replacing any parts, is a job best left to a professional unless you have specific training. But you don’t have to do any of this yourself. A good Las Vegas AC company should offer routine service calls, with full inspection and preventative maintenance, for a low fixed price. Don’t add another chore to your to-do list. Ambient Edge is your top-rated local AC service company. We can provide complete routine maintenance on an annual or twice-a-year basis—with 100% satisfaction guaranteed. Call us at (702)948-7201 or fill out the form to your right and speak with one of our service experts today.